Landscaping work, which includes, filling, re-grading and adding hardscape or retaining walls is considered DEVELOPMENT under the Conservation Authorities Act and a permit will be required if the landscaping is proposed within a regulated area. 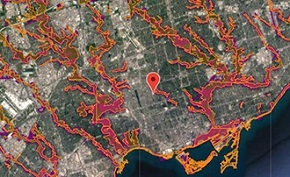 Under Ontario Regulation 166/06, the TRCA regulates and may prohibit work from taking place within valley and stream corridors, wetlands and associated areas of interference and the Lake Ontario waterfront. If your property is regulated, you must apply for a permit from TRCA prior to carrying out any new development. Landscaping work including filling, re-grading and adding hardscape is considered development under the Conservation Authorities Act. Existing and proposed surface treatments (eg. manicured grass, flagstone, concrete). Location and height of any proposed retaining walls. Note stating amount of fill to be added (in cubic meters). Setback dimension from the top of slope (or stable top of slope where applicable) to any proposed hardscape or retaining walls (if applicable).